Our April-May magazine is out now. 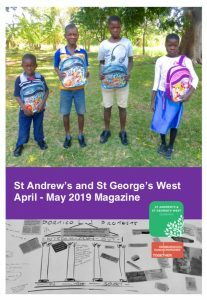 Very Rev Dr John Chalmers finds the hands and face of Christ in surprising places; Alison Campbell reflects on Dr Arie Glas’ visit from Malawi and Mary Davidson looks forward to the next Christian Aid Sale. Plus: a joint programme of reflection and worship for Easter at Edinburgh City Centre Churches TOGETHER, and thoughts from Peter Millar and Pat McKerrow on finding inspiration in nature in times of turbulence.